The fact that this genealogy is not canon makes De Campi’s storytelling that much more special to me. She chose to make him Jewish so she could write a Hanukkah party into her web-series; this was her response to the shooting at Tree of Life Synagogue in Pittsburgh that took the lives of 11 Jews on October 27th. As she says at the bottom of the strip: “I wasn’t going to write any more of these [Hell’s Kitchen Movie Club strips] but then the Pittsburgh Synagogue shooting happened, and I got real, real mad.” De Campi made Bucky Barnes Jewish as a response to anti-Semitism. Jews played a prominent role in the origins of the superhero genre as prompted by their marginalized position in American society, creating the fantasy that the nerdy boy with glasses can transform into the muscular all-American hero. And it might be tempting to read De Campi’s response in the same vein, responding to a violent attack with a fantasy of a Jew who could fight back. But the story goes in a different direction. It’s not a tale of Bucky Barnes facing off against masses of Hydra goons, a revenge fantasy that might be expected given their Hydra’s origins as a rogue science unit of the Nazis. Bucky Barnes fought the Nazis during WWII, and then became a prisoner of Hydra who experimented on him and gave him his abilities, so it would not be a stretch to use his backstory as part of a response to anti-Semitic violence. But instead we have the Winter Soldier and the Punisher celebrating a heimishe Hanukkah. Although a story of Barnes and Castle on a blood-soaked mission of vengeance, a la Inglorious Basterds, might have offered a certain kind of catharsis, this response is also effective, and more complex. It is in keeping with the series created by De Campi strips focusing not on glorifying the violent side of these gritty characters, but rather on themes like “loss and PTSD,” as De Campi says below the strip from October, 2017 titled Silent Runnings. Further in that strip, Frank Castle reacts to the way his character has become a symbol for “bent cops” and racists committing violent murders. As she makes clear in the comments below, De Campi is thinking about current events, and what it means to tell stories centring extremely violent characters whose status as “heroes” is questionable. It is in keeping with this direction that in the Hanukkah special, a response to anti-Semitic violence does not take the route of telling a story about superheroes saving the day via violence. Henry saying to Bucky “You survived” is also the Jewish response the strip provides to anti-Semitism: we are still here. The humour in the episode is an important aspect of this response; it’s not just portraying survival, it’s depicting its characters as genuinely happy. I don’t think I’ve seen the Punisher ever seem so amused as when people offer to tell him embarrassing stories about Bucky as a kid. And there is nothing funnier, or more fitting to the context, then a girl asking if she can go to “evil-science Nazis” to learn Hebrew like Bucky Barnes did, rather than learning it through Hebrew school. This Hannukkah special engages with a growing trend to encourage Jewish visibility in media around Christmas time, as a way to be more inclusive. But De Campi does so in way that is thoughtful and touching. Further she touches on and subverts violent narratives in this specific strip and in the series as a whole, in a way that is a really powerful counter to violence and bigotry. There are, in my opinion, many great reasons to be excited about Nnedi Okorafor’s new comic book series, Antar the Black Knight (Antar the Black Knight #1 Preview). You don’t need me to tell you that she is a master storyteller- she has the awards and reviews to prove it. Further, while I believe that the subject of her book is extremely timely it is not my place to write about that- I will leave it to others who are more qualified. What I do feel qualified to write about is not divorced completely from these aspects of the work, but stems from an issue that I have been thinking about a lot for some time. or this one on White Nationalism and the Ethic of Medieval Studies by Sierra Lomuto: http://www.inthemedievalmiddle.com/2016/12/white-nationalism-and-ethics-of.html. One aspect that I and others touched on is the role of fantasy people read growing up in inspiring them (us) to become medievalists, and how this in turn shapes our expectations of what the middle ages looks like. To put it bluntly if our fantasy middle ages looks like a white Christian or Pagan Europe, and that’s what prompts people to come study the middle ages, then that’s what they will expect to find in the “real” middle ages. Further we noted that many first (and even higher level) courses work on this expectation- knowing that students are interested in Templars, Castles, Dragons etc- choosing the texts and topics that will feed this interest hoping to draw students in to the field. Obviously this is just one strand of the problem- but it is not an unimportant one. And this is why Okorafor’s Antar excites me- imagine students drawn to our field because they have read about a knight who is black, who is biracial, a story that does not come from a Eurocentric context (just look at the cover of issue #1 and you will get a sense of what I mean). Students who have seen characters from an African language in comic books, as well as quotations from pre-Islamic poetry? And that’s just for starters, because, and I won’t get into this at length here, Antar was both an important poet in his own right (the first part of the title of my post is a play on a line of his poetry), as well as a character in a lengthy epic transmitted orally for many years. He connects and crosses so many different important cultural and literary categories that students who come to the field inspired by his story are really primed to engage with a very complicated middle ages. Imagine generations of medievalists who saw themselves represented in a comic book and said: “I want to study that middle ages”! Now obviously I can’t predict that one comic book series will have such a profound impact- I think, or rather hope it can, but also I believe that we who are currently scholars and teachers of the medieval ages need to be proactive in changing the field or else this changes won’t happen. Imagine the student coming to study the middle ages inspired by a black Muslim knight who gets the message (explicitly or implicitly) that “oh no, that’s not really part of the medieval world), or is asked (again maybe it’s never stated explicitly) “why would someone who is not of European ancestry be interested in studying the middle ages.” This is why the Medievalists of Color collective is so important to our field- we must do more to support it. This is also why the work of @medieavlpoc, much of it public facing, which is aimed at showing people that even the European middle ages was not so white needs support. And of course there is other work being done to change the field- my point here not to list all the work being done- just to note how that work can be reinforced by pop culture phenomenon like this new comic book. If you teach courses that explore medievalism- consider adding this comic book to your syllabus. Please note that I have a disability that impacts my writing- I try to make things as polished as possible- but sometimes in the interest of just getting something out there both in a timely manner- and in away that reflects my thinking- it’s not always possible to have it fully copy edited. Please don’t let any typos, grammar errors etc influence how you evaluate the post. Oxford, Bodleian ms Heb. 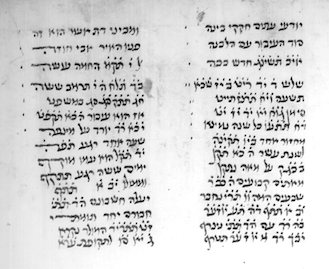 d.11 is an autograph manuscript, compiled mostly by a man named Ela’zar HaLevi who lived in Germany in the mid 14th century. In his 2008 book about the manuscript, known variously in scholarship as “the Chronicle of Jerahme’el” or “The Book of Memory,” Eli Yassif argued that at least part of the codex is actually a well-crafted historical chronicle. This chronicle section begins on fol. 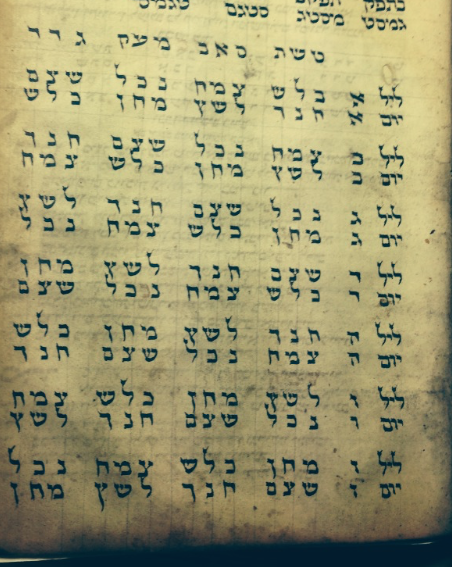 7r with the words זהו ספר הזכרונות (see image below)–This is the Book of Memory–and runs all the way to fol. 258v. As an example of this technique, Yassif notes that the texts dealing with the creation of the fetus in the womb, for instance, are interpolated into a text dealing with traditions about the creation of man on the sixth day. There is a topical connection between the two, as both deal with ways humans are created–either the original one-time creation or the continual ongoing creation of new humans. Yassif lists more examples of this technique, and it becomes quite clear that it is in operation for much of book. In this series of blog posts, I will show connections between the section treated by Massif (which I will refer to as the “historical chronicle” section) and other parts of the manuscript. I can’t at present provide an argument connecting all of the materials in the manuscript together, but it is worth exploring connections beyond what Yassif outlines. Further, I will argue that a lot of what is going in the Book of Memory parallels and anticipates what Elisheva Carlebach argues occurs in the later Sifre Evronot, the subject of her excellent book Palaces of Time: Jewish Calendar and Culture in Early Modern Europe. These seven servants S’ V’ M’ M’ S’ J’ M’ [ם צ ש ל כ נ ח] were created by God, and He ordered them in the heavens to serve the needs of the world, that those who come into the world will count with them signs, and set times, and calculations and summer, and the number of hours and days, months, times and days, and set times [sic], as it says: “they shall serve as signs for the set times—the days and the years” [Gen 1:14]. These are their names: Hammah [Sun], Nogah [Venus], Kochav [Mercury], Levanah [Moon], Shabtai [Saturn], Tsdek [Jupiter], Maadim [Mars]. (my translation – see Yassif’s page 80 for the Hebrew). “שבתאי [Saturn] is in charge of poverty and suffering and times of illness, and of disease and injuries of the body that cause death. His form is like an ancient of days sitting with a scythe in his hand. That is what he looks like. This is a table that provides information about the 19-year cycle of intercalation (עיבור)–i.e., the years where a month is added to the Jewish calendar–and it lists the days of the year on which the Jewish New Year will fall, noting also whether the year is full or defective. 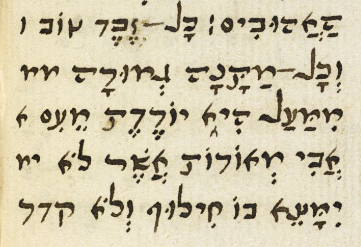 It covers a 273-year period, starting in the year 5093 since creation (c. 1332 CE, and note that the final two lines are later additions — thanks to Justine Isserles and Nadia Vidro for help with this). 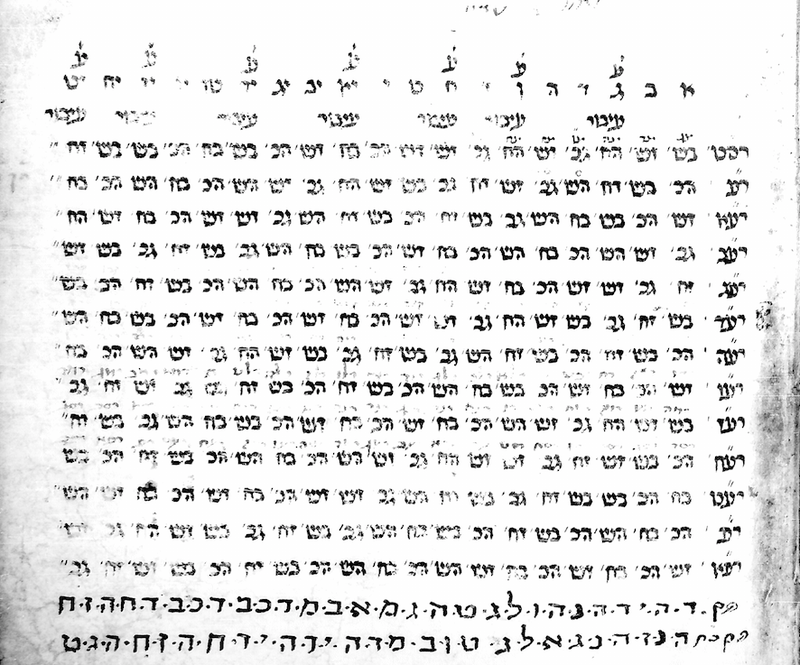 Tables such as these and other time-related materials can be found throughout the manuscript: they include religious material (such as information about Torah-reading cycles), medical material (such as information about the best times in the day for bloodletting), astrological material (such as good and bad days of each month for starting something new), and more. Inner columns of folios 386v-387r. Likewise the acronym of these seven stars (ם צ ש ל כ נ ח), introduced for the first time on fols. 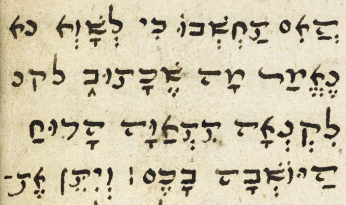 9r-v, appears several times later in the codex, often just as an acronym but sometimes with the letters explained, almost always in this exact order but sometimes broken up in various ways. 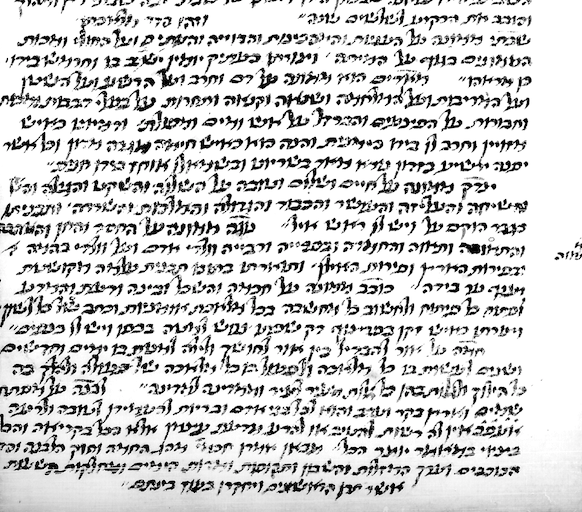 This short text is actually written sideways on folio 365r, and while it and several other pieces (such as the text already cited on the penultimate folio of the manuscript) may be later additions to the original text of Ela’zar, they are clearly building on a trend that he established and at least showing how the book used. 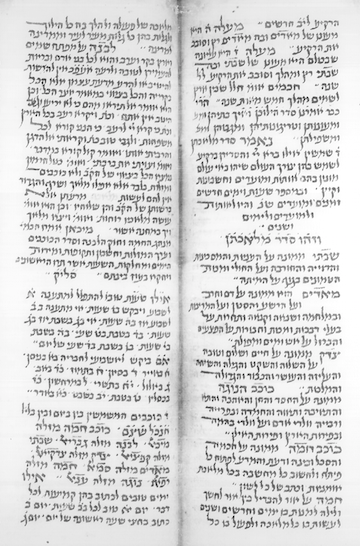 The opening lines of this poem seem reminiscent of the trend in later Sifre Evronot (books dedicated to the ibbur and other technical elements of the Jewish calendar that appeared in the early modern period) to consider knowledge of the ibbur “as coming from a divine realm” (Carlebach 86). Even if Yassif is right and on some level El’azar’s focus was only or mainly on the historical chronicle section, and even if some of these materials were added by later scribes to the manuscript, these are also a product of the “loop and hook” approach adopted by Ela’zar. While to some extent all of these various charts, tables, and texts would have been useful to a medieval Jew–it is good to know the best times of day to pray, etc.–presenting them in this fashion goes beyond mere use: it serves an ideological function. A central theme of Oxford, Bodleian ms Heb. d.11, I think, is the nature of time. The book presents an overarching argument that all of these various systems were set in motion on the fourth day of creation. This argument leads to the deeper connection between the historical chronicle section of the manuscript and its other materials: the historical narrative–from Creation to the Messianic Age–is deeply entwined with these other elements of time, represented by cycles of years, cycles of Torah readings, astrological cycles, and so on. The book is doing something similar to what Elisheva Carlebach describes in relation to Bede and Christian time: “it conjoins computus in one seamless work with cosmology, chronology, history and [Jewish] eschatology” (9). Carlebach, Elisheva. Palaces of Time: Jewish Calendar and Culture in Early Modern Europe. Cambridge, MA: Harvard UP, 2011. Yassif, Eli. The Book of Memory that is The Chronicle of Jerahme’el. Tel Aviv: Tel Aviv UP, 2001. In the conclusion to her Christian Materiality (2011), Caroline Walker Bynum opens the door to an expansion of her discussion of medieval materiality and religion to Judaism and Islam: “Understanding the full materiality of Christian belief and practice,” she says, “may help to clarify at least one of the ways [i.e., the material way] in which medieval Christianity (and, in certain aspects, its modern descendants) is similar to, yet differs from, its sister religions, Islam and Judaism” (273). This session proposes to go beyond Bynum’s brief concluding survey, focusing specifically on the relationship between Judaism and Christianity. The rational for the focus is the well-documented tendency in Christian thought to present Judaism as the “material other” to Christian spirituality. On the one hand, many accounts of debates between Jews and Christians turn on the kind of generative matter Bynum describes in her book. On the other hand, the idea that Jews, bound to a literal reading of scripture, are blind to the spirit even as they physically bear their scriptures to the corners of the earth, is based on the spirit/matter binary that Bynum’s work problematizes. As much recent work on materiality has radically changed how we think of medieval Christianity’s relationship to the material, it makes sense to rethink how this impacts thinking about Jews and Judaism. The revaluation cannot be one-sided, however, not just about how Christians related to Jews; it must also involve a rethinking of Jews and “holy matter” as well. Christian “holy matter” surrounded Jews—on the outside of cathedrals and churches, displayed in processions, even in Jewish illuminated books–and Jewish natural philosophers drew on the same theories of the natural world as their Christian counterparts. On the other hand Judaism (at least as in the form dominant in the middle ages) grew out of a different ontological attitudes toward the spirit/matter hierarchy than did Christianity (at least in theory); it embraced the material and did not view it as negatively as early Christians, a rabbinic stance that influenced medieval descendants. Might the new understanding of medieval Christian materiality change how we understand the medieval Jewish attitude toward the material too? How does it inform, or react to, Jewish attitudes toward holy matter? This session invites papers that rethink medieval Judaism in light of the material turn and the new materialisms generally, either from the perspective of Christianity (how did Christians relate to Jews and materiality? ), or from the Jewish perspective (how does our changing understanding of materiality in the surrounding Christian culture apply to, or contrast with, our understanding of medieval Jewish culture?). Ideally, this session will stimulate discussion between people working in diverse topics and fields. It is a chance to make use of the varied audiences and disciplinary foci of a big conference like Kalamazoo, and it seeks to make space for fruitful and unpredictable interactions. Please submit abstracts of no more than 300 words to sboyarin@uvic.ca by Tuesday, Sept. 15, 2015.